Redruth head coach Steve Larkins says his side are not panicking despite only winning two of their last eight National Two South matches. The seventh-placed Reds host bottom-of-the-table Dings Crusaders at the Rec as they try to turn their fortunes around. 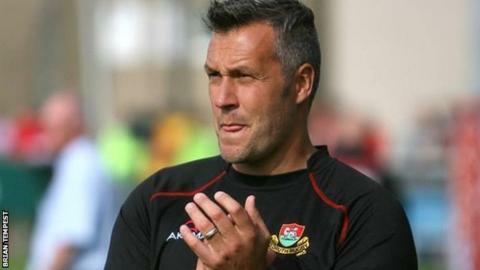 "You don't become a bad team in one or two games and there's no panic in the camp," Larkins told BBC Radio Cornwall. "I'm sure this weekend the boys are looking forward to putting right what went wrong last week." "Following a disappointing loss away you've always got to loom to bounce back and hopefully this weekend we can do that," Larkins added. "We're always saying there's ifs and buts, and we're getting close to improving every week, but this week it's a game that's very important and we've got to really win. "We're trying to target every game, but realistically when you're playing against some of the top teams that is difficult to do. "But against somebody like Dings we've got to make sure this weekend first and foremost we get the win, and then we can think about bonus points later on."